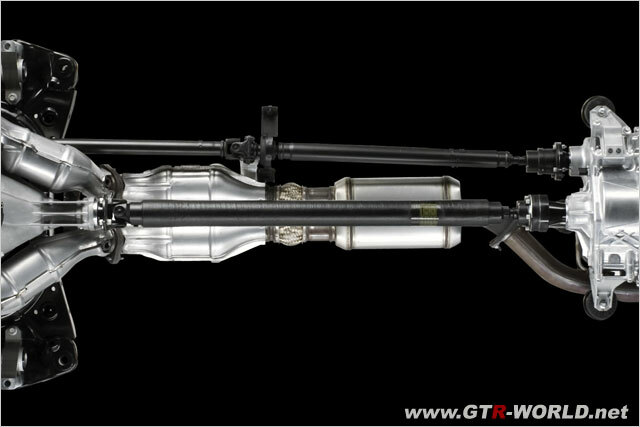 The new GT-R has been also installed with the expected semi-automatic transmission. Nissan calls it “dual clutch” – the same system of the twin clutch Golf and Lancer Evolution have adopted. When the second gear is applied, the third gear is stand-by. At the moment of flipping the paddle switch, the clutch can be appropriately shifted. The GT-R gear-change takes only 0.2 seconds. That is superb. This is not the amount of time it takes to select the gear. In case of GT-R, it takes only 0.2 seconds to drive the rear-tire after flipping the paddle switch. To achieve this, it must have been essential for Nissan to improve the accuracy of each gear, each propeller shaft and drive shaft, and each joining part. Therefore, in case of the competitors, it should take more than 0.2seconds. Well, for the achievement of 0.2-seconds gear-change work, every gear is given triple-corn synchro. Generally, the material for the synchro is made by brass, not by friction materials. 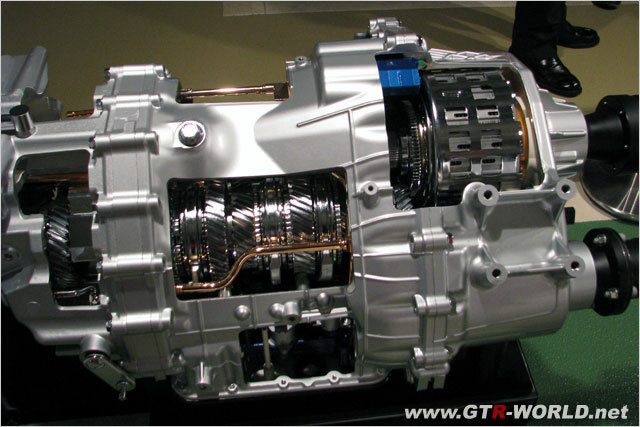 But, the GT-R synchro is made by the same friction materials as that of the clutch disk. This fact resulted in shortening the time to change the gear. The quick gear-change has been achieved. The friction material for the clutch is applied by the six-plate clutch made of carbon composite. The six-plate sounds a little surprising. 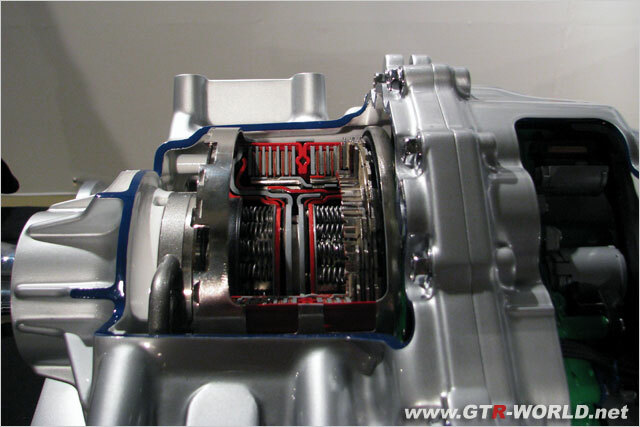 In fact, the dual triple-plate clutch is adopted. However, it is still surprising for the production car. By the way, speaking of the triple-plate, the rattling noise is the concern. But, in case of GT-R, there is no concern about the noise as the wet type is adopted. Same as the gear, there exists the clutch in the transmission oil. This enables the lifetime to be extended overwhelmingly. As long as the ordinary use is secured, there is no need for the clutch replacement. In case of the second-generation GT-R, the clutch tuning used to be the regular item. But, in case of the new GT-R, there seems to be no need for the tuning. Of course, no other aftermarket sport clutch can have better performance than this. The weight reduction in rotary parts is essential to improve the response. The new GT-R main propeller shaft is made of carbon fiber. The advantages of this effect are not only for the response improvement and weight reduction. Usually, when the propeller shaft is made of the steel pipes, the acceptable speed limit is about 250km/h. Because of this, on the R34GT-R with the export spec, the speed limiter has been actuated at 250km/h. The President Carlos Ghosn said on the TV program, “The new GT-R is a kind of car which allows you to make usual conversations at 300km/h.” This remark was resulted from the technical confident they have. Additionally, there is no propeller shaft on Porsche or Ferrari.